I’ve had plenty of time over the summer to reflect on last season and form my predictions for the new 2017/18 Premier League season. In this post I’ll firstly recap on ways you can improve your approach to football betting, and then give my views, as a mere football fan, on who I think is most likely to win the Premier League this season. Before I get started with my (rather speculative) predictions, I’ll point you in the direction of some other, more technical posts I’ve written about football betting. So where do you go if you want to check head-to-head data items such as ‘shot accuracy’, ‘total forward passes’ or ‘errors leading to a goal’? The answer is Squawka. Check out my post on football stats to learn how you can make more informed bets by using simple data analysis tools. It’s not too difficult to create a betting system that breaks even over a lot of fixtures. But it is difficult to generate a longterm profit. Most football betting models are completely blind to a whole bunch of ‘alternative’ key factors. Find out what these key factors are from my post here. Football has more interference, more hype, and more noise than probably any other sport. With so many variables to account for, football markets sometimes neglect what really has an impact on the game. And this is precisely why stats-based models have the potential to thrive. Take a look at the basic approaches you can apply to football prediction. I placed an equal £5 stake on 270 Premier League fixtures and monitored my results. I didn’t analyse the games for a mathematical edge, and I didn’t use any trading techniques. I simply backed at the best possible odds on selections I believed were good value. The result was a break-even 0.00% ROI (which is exactly what I predicted). Learn more about what your expectations should be from casual betting. Who’s The Strongest Team In The Premier League? Based on last season alone, Chelsea were strongest team statistically (see Squawka), and this was reflected by their points tally. They won the title by 7 clear points, remember? I’m inclined to say that Chelsea are still the strongest team in the Premier League. I fully expect them to compete again this season. I realise that they’re not without issues at the moment (e.g. Costa, players bans, injuries). But they have squad depth, quality, and an undoubtedly passionate manager that makes them my #1 pick. However, to decide the ordering of the remaining Champions League spots is incredibly difficult with so many variables to account for at this early stage of the season. What do the majority think? Let’s check the Betfair market. Man City are hot favourites, with Man United the strong 2nd favourites. 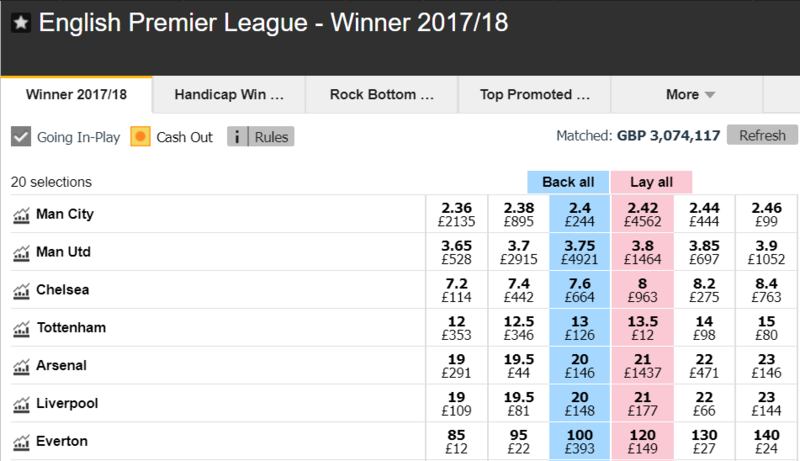 Chelsea and Spurs (the 2 top teams last season, I might add) are priced somewhat higher, implying much less chance of winning the league. Chelsea are believed to be almost twice as likely to win the league than Spurs. Arsenal and Liverpool share an equal outside chance of 20.0 odds to win the league. It’s early days. But I think the top four will include Chelsea, Man City, Man United, and Tottenham. I agree with the Betfair market on the teams, at least — just not the ordering. I also agree that Arsenal and Liverpool will fall outside of the top 4, and in my mind should be priced around the same value as one another. What I find most unconvincing about the odds is that the two Manchester clubs are such strong favourites already. Are they really that far ahead? I noted in my Mug Betting Experiment that inflated/deflated odds seemingly evaporated as the season progressed. With increasingly more data points to work with, the public naturally discovered the correct prices over more fixtures. So I’m certainly thinking that value exists in the betting markets at this early stage. Right now, with hardly any performance data on the new team lineups (or even the newly promoted contenders in the Premier League), we can’t accurately judge the upcoming season. It’s still unpredictable. Therefore the market’s views surrounding the new season’s top 4 are largely formed on fan speculation. Pub-chat, YouTube compilations of new signings, and whatever other gossip is being spouted by the news plays a part in this. Learn more on how odds are formed here. With all this in mind, I’m trying to block out the hype, and be realistic. With everything considered, I’m personally still not convinced that both Man City and Man United ought to be such hot favourites for the 2017/18 season. They’ve got a lot of ground to make up on last season. In fact I think that the top 6 will be tighter — which is one of the great things about the Premier League right now. But I understand the bias: there’s such high levels of expectation and excitement surrounding United and City. Just be aware that the market could change drastically over the coming months. I’ll elaborate on these 2 teams in particular. How Much of an Impact Will New Transfers Have? It’s been a manic window so far, with many ridiculous transfer fees involved. Man United and City are the 2 major players in this. So is it surprising that they’re the most highly rated by the public? For the record, I rate the transfer business Man United have done this window. I can’t envisage how they won’t improve on last seasons 6th place finish. I also believe that Man City have the added the quality needed to improve on last season’s 4th place finish. But I’ve said it before: the hype of new signings is in the interest of the sport as entertainment business. It sells papers, Sky Sports subscriptions, shirts and season tickets. You don’t get a record transfer player joining a club with the media writing “this guys going to be a complete flop!” across the board. The narrative is of high optimism — not pessimism. And that’s precisely this reason that I think the likes of Spurs — who have made just one signing this summer window — have experienced far less public optimism than the two Manchester teams. This is shown by the Betfair market pricing them at 13.0 for the league. For me, there’s more potential value in backing Spurs than there is in Man City. Even if you’re just looking to trade out. After all, a squad can look great on paper and still lack the cohesiveness needed to win games. We simply won’t know how City and United’s new individuals will impact their team’s performances this season until they’ve played through more fixtures. For now, I still think it’ll be tighter at the top between the more established (and proven) London line-ups put out by Spurs and Chelsea, and the Manchester clubs, than the current odds suggest. Something I pointed out at the start of last season was that the more balanced teams — with both strong attacking and defensive qualities — tend to beat unbalanced teams over the course of a season. Top-heavy line-ups like Liverpool and Man City couldn’t maintain consistency last season, and lost points as a result. United were an abnormality in that they had the statistical performance of a well-balanced team, without the points tally to back it up. They failed to convert enough goals, essentially. See my full analysis here. As a Spurs fan, I must admit that I fear the Man City and Liverpool attacks the most. However, are either of them steady enough at the back to win the league? It’s not only about scoring. Even now, with City’s new signings, I’m not totally convinced they’ll walk this. Actually, I doubt they’ll outperform rivals United over the course of the season. In general, as I’ve mentioned, I’m speculating that the odds will shorten on Spurs and Chelsea as the season goes on, with Man City likely to drift. Arsenal, and particularly Liverpool are likely to dip in and out of the top 4. They characteristically have ‘off’ seasons. I don’t think that’ll happen yet, though. They’ve had a few upsets early on this season, but their quality will still shine through later on. In particular, Hazard will return and make an impact. When fit, he’s the strongest player in the league. Recall that Chelsea made a slow start to last season, so now isn’t the worst time to back them. United, I feel, are destined for top 4. It’s expected of the club and of Mourinho. They’ve made safe, proven signings and built on the foundations of a very strong defensive team last season. They’re looking as if they’re finally shaking off that hangover from the ‘Fergie era’ and moving forward with a good line up. I expect bigger and better things from them. Ironically, I don’t feel like they’re quite as poorly priced (overrated) as they have been in previous years. Yet I still don’t see much value in their odds. United prices are often pushed by volume/hype at this stage of the season. Spurs benefit from continuity. They’ve got pretty much the same team that’s outperformed everyone else over 2 seasons joint together — yet they’re barely mentioned as serious title contenders. They haven’t won the League title since 1961. There’s been 2 consecutive seasons where they failed to capitalise. First Leicester, then Chelsea. They’ve had very little activity in the transfer market this summer. Their home fixtures throughout 2017/18 are to be played at Wembley, away from White Hart Lane, where they were unbeaten last season. All said and done, I still think they’re a good bet. You can count on Kane, Alli and Son to destroy teams. And if you’ve watched the team’s overall performance at Wembley, you’d see that results can only improve at the stadium for Spurs (but I’m biased). They’re cited as the most likely champions. Given their quality that’s understandable. They need to perform a lot better than last season, though. Will the new goalkeeper, Ederson Moraes prove competent in the Premier League? There’s no time for an adjustment period, which many overseas Keepers require. I think there’s too many unknowns with City to make them such a strong favourite. Their short price of 2.4 isn’t attractive. I think they’ll be hit and miss throughout the season. They’ll annihilate some teams through the likes of Salah and Mané — with or without Courtinho. But whilst pacey and exciting in style, is there still a feeling that Liverpool are destined to repeat last seasons performance? Without another central defender I’m inclined to think yes. They’ll beat anyone on their day. Still, I don’t think Liverpool will have enough to compete for the title. United are likely to displace them in the top 4 this season. Sanchez will come as a loss to them (if he finally leaves). He’s one of the Premier League’s standout players. Arsenal can’t realistically replace him, especially with only Europa league European football. Thursday nights loom. That said, I like the look of Lacazette, and I would’ve loved Spurs to sign someone of that standard to back Kane up. I expect him to hit the score sheet frequently, and to plug the ‘gap’ at Arsenal. If Wellbeck stays fit then there’s potential for Arsenal to exceed expectations. They will grind out a decent points tally and be in the top 4 running. I just don’t see them seriously competing for the title by the latter stages of the season. One glance at their competition reaffirms my views on this. These are, of course, just my opinions. I’m one of millions of football fans. I could be wrong. Maybe Stoke will win the league. If you’re thinking of analysing past data to predict football, then note that delving back further than one season has obvious limitations — particularly in non-static leagues like the Premier League. Think about it, if you used a 2 year window to make predictions for this season then Leicester might make it into your top 4 over Chelsea! Want a second opinion? There’s plenty of Football tipsters to choose from over at Betting Gods and Tipstrr. Can You Earn From Mug Betting On Every Premier League Fixture?